The photographer of Firing Squad in Iran, Jahangir Razmi, remained anonymous for 27 years, until a journalist from the Wall Street Journal tracked him down. On August 27, 1979, a 30-minute-long trial in Iran—in which no evidence was presented—declared 11 defendants “corrupt on Earth” and ended with a hasty death sentence of all accused. The sentence was carried out minutes later as the 11 political prisoners accused of inciting riots formed two lines near an airport in Sanandaj, Iran. 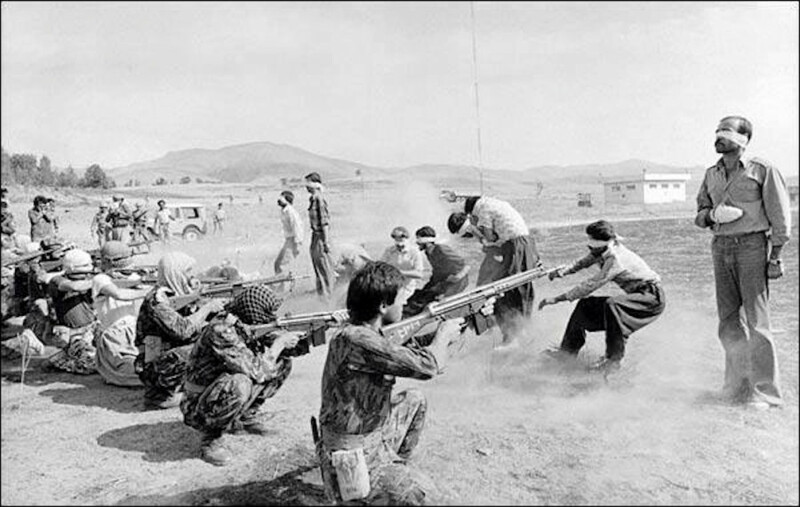 The men were executed by shooting, their final moments immortalized in what would soon become a Pulitzer Prize-winning photograph titled Firing Squad in Iran —the only Pulitzer to be awarded to an anonymous photographer. The photographer, Jahangir Razmi, remained anonymous for 27 years, until a journalist from the Wall Street Journal tracked him down. This moment, in its surreal drama and reflection of the 20th century, is precisely what filmmaker and Concordia English literature student Bahman Tavoosi attempted to recreate in his documentary A Dress Rehearsal for an Execution. A Dress Rehearsal for an Execution follows director Tavoosi (played by Amirhossein Asgharzadeh) as he tries to reanimate the iconic image through the perspectives of a diverse cast from Montreal. The docudrama is dark, mysterious, and brilliantly narrated. Tavoosi draws attention away from the localized context of the photograph and focuses on its representation of an entire century of images, and of resistance. The process results in a cast that represents struggles from South African apartheid to those of post-Communist Eastern Europe. “The remaking of the photo is not at all a loyal remake in terms of the gender, the political backgrounds, or the nationality [of the characters]. The main concern that we had during the long period of auditioning the actors was to collect stories,” Tavoosi explained. The 29-year-old student was born in Iran in 1984 to a Turkish-Kurdish family and lived in Tehran until moving to Canada in 2006. He credits his interest in cinema to the atmosphere of post-revolution Iran. “Back home, [my generation] is called ‘the children of the revolution,’” he said. Though Tavoosi distances the image from its Iranian context in his film, it’s clear that it carries a personal resonance for him. In 1979, just months before the iconic photograph was taken, Iran’s Islamic Revolution flooded the streets with leftists, students and Islamists and quickly dismantled the U.S.-backed Shah regime. Mohammad Rezā Shāh Pahlavī, whose administration was installed after the U.S. toppled a democratically elected government in 1953, fled the country, and an Islamic Republic led by Ayatollah Khomeini was set up in his place. Soon after Khomeini took over, the 4 million Sunni Kurds living in Iran demanded independence and the regime responded by sending in the Revolutionary Guards to violently suppress the uprising, killing an estimated 3,164 people. Razmi’s photo, the subject of Tavoosi’s film, depicts the resistance of those Kurdish rebels, and though he stops short of directly addressing the links between the photo and his own Kurdish background, Tavoosi says the film was an important one for him to make. A Dress Rehearsal for an Execution premieres in Quebec at Cinémathèque Québécoise (335 de Maisonneuve Blvd. E.) on July 23 at 6:30 p.m. Contact Chloe Mercedes Morin at chloe.m.morin@gmail.com or at 438-880-9642 for tickets. A limited number of tickets will also be available at the screening. Tickets are $12.